ANAHEIM, CALIF. (PMA #2220), Feb. 21, 2010 - Sony is exhibiting an array of innovative digital imaging products at the Photo Marketing Association (PMA) 2010 International Convention, including a concept model of the new compact α (alpha) DSLR camera system that employs an Exmor™ APS HD CMOS sensor, which provides full AVCHD video capability. New concept α products being shown include an ultra compact model with interchangeable lenses, additions to the α family (including a successor to the α700), along with new TX5 and H55 Cyber-shot® cameras, new printers and other accessories. 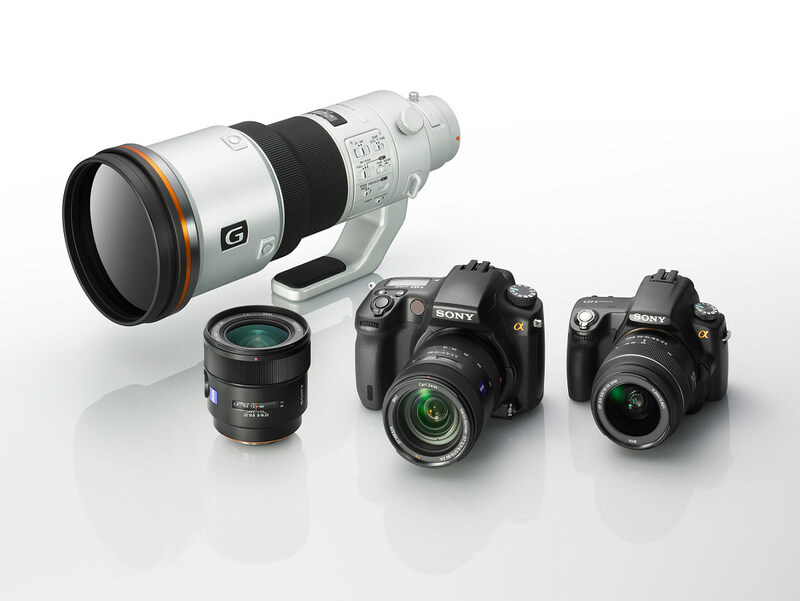 In addition to its α line of DSLR cameras, Sony will also showcase its new Cyber-shot digital still cameras. These models include the recently announced TX5 certified waterproof camera and H55 high-zoom, compact camera. The DIMA award-winning TX5, which can be used in depths up to 10 feet for up to one hour, is the world's thinnest and smallest waterproof digital still camera with Optical SteadyShot™ image stabilization and touch-screen operation. Additionally, the 10.2 megapixel model is Sony's first digital still camera with an "Exmor R" CMOS sensor that is also certified to be freeze-proof down to 14 degrees Fahrenheit, shockproof (up to about a 5-foot drop) and dust proof. The TX5 also offers outstanding low-light performance, high speed, Intelligent Sweep Panorama, 720p high definition video recording and in-camera Backlight Correction High Dynamic Range features. The 14.1 MP H55 camera's 10x optical zoom Sony G lens with 25mm (equivalent) wide angle is designed for shots from greater distances and of wider landscapes. Featuring 720p HD movie recording, the H55 model also offers Optical SteadyShot™ image stabilization to help reduce blur in photos without compromising image quality. It also adds Optical SteadyShot™ with Active Mode, which lets you shoot smoother movie footage even if you are walking while shooting. One retail photofinishing system and one professional printer along with four new digital imaging accessories will also be on display. The new PictureStation™ retail instant photo kiosk solution is simple to maintain while offering small to large-scale stores a cost-effective way to drive additional revenue. Event photographers will also want to take a look at the DIMA award-winning UP-DR80. Sony's dye-sub printer is fully portable; with world-class speed and versatility professional event photographers need on the go. Digital Imaging accessories include sports and marine packs, a floating strap (model STP-FSA) for the TX5 camera, a photo printer/frame, Party-shot™ automatic photographer, DVDirect® recorder, as well as a full line of fashionable and functional cases and camera bags for Cyber-shot cameras and Handycam® camcorders. As the leader in the high-definition camcorder category, Sony offers superior technology in its HD models, even at entry level. Now all 2010 HD Handycam models will feature the "Exmor R" CMOS sensor with a new algorithm to realize 2x faster "Quick AF," Face Priority to prioritize a specified face for focus, color, exposure and Smile Shutter™ technology, and Highlight Playback for quick video slideshow generation. The new HD Handycam camcorder lineup will also offer iAuto, 60p output, and a new user interface, in addition to capturing content in full1920 x 1080 high-definition video recording at up to 24Mbps, the highest bit-rate offered by the AVCHD format. The portfolio includes the top-of-the-line HDR-XR550V unit featuring a 240GB hard disk drive that holds up to 101 hours of HD video (LP mode) and a Wide Angle G-lens that captures approximately 2x larger shooting area than previous models. Sony improves Optical SteadyShot™ image stabilization with Active Mode by expanding the 3-Way Shake Canceling feature across the full zoom range - from wide to telephoto end, and adds a new feature called Golf Shot to the high end camcorders. This function renders two seconds of motion (golf swing) into a sequence of up to 22 still images. In addition, the camcorder can take 12-megapixel still photos and has advanced features including an assignable dial for manual control (Iris/Shutter/Exposure/WB//Focus/AE shift). Also on display is the new HDR-CX150 Flash Memory Handycam camcorder offered in black and red. For around $550, this model can capture 3.1-megapixel still photos and includes 16GB of embedded memory, a Carl Zeiss® Vario-Tessar® 25X optical zoom lens, and SteadyShot® image stabilization with Active Mode -- all in a compact design. In addition to the hard disk drive or built-in flash memory, all of Sony's new camcorders can record video and still images directly to Memory Stick PRO Duo™ media, Secure Digital (SD), or SDHC media card (all sold separately).